How Can I Get Rid of Carpenter Bees? Anyone who has spent countless time outdoors knows that carpenter bees can be intimidating with their hovering, death “stares” and darting movement. However, despite their menacing, “ready-to-fight” demeanor, these bees are generally harmless. Carpenter bees are pollinators who are an asset to the environment but can sometimes cause aesthetic damage to various structures on a homeowner’s property. So, what can you do about it? Can you even get rid of carpenter bees or do you just have to deal with their annoyances? How Do I Know if I have Carpenter Bees? Do you see large black and yellow bees hovering and darting around the eaves of your home, around your deck or around wooden playsets? If so, then it is possible that you have carpenter bees nesting in your structures. Since carpenter bees are solitary bees, their nesting habits are quite different from other bees. For instance, bumble bees, who are often mistaken for carpenter bees, usually nest in the ground, but carpenter bees will create tunnels in wood to lay their eggs. If you notice a number of large bees flying around the eaves of your home, you probably have carpenter bees. What Type of Wood do Carpenter Bees prefer? Is there a particular type of wood that carpenter bees would rather nest in? Yes! When a female carpenter bee is looking to nest, she typically prefers bare, unpainted or weathered softwoods. Pressure treated or painted wood is less susceptible to carpenter bee nesting. Although they prefer bare wood, don’t be surprised if you find them nesting on your wood-stained deck as the stain isn’t as much as a deterrent as paint. The wood stains are less reliable than paint but could provide some degree of repellency as opposed to having bare wood. What Kind of Damage Can Carpenter Bees Cause? Carpenter bees, although harmless, can cause aesthetic damage to your home, primarily with their drilling and staining. During the spring (April and May) months, carpenter bees re-emerge from hiding in abandoned nests over the winter to mate. After mating, fertilized females will excavate tunnels in wood to lay their eggs (about 6-8 eggs) in a series of small holes. You will notice that the holes are perfectly round and are about the diameter of a finger. Female carpenter bees will create one nesting hole, so if you happen to notice several holes, that means you have multiple bee nests. It’s a one-to-one ratio in respects to bees to nests. Since the majority of damage caused by carpenter bees is purely aesthetic, Cooper Pest Solutions’ CEO Phillip Cooper explained that if the staining from the drilling isn’t bothersome, then you may choose not to do anything. Sometimes females may return to the same nesting sites year after year, creating new tunnels for egg laying. If this is the case, aesthetic damage can increase from one year to the next, unless you choose to receive treatment. Although female carpenter bees may only be causing aesthetic damage to your property by nesting, you may also notice increased woodpecker activity in the same area as the nest. This happens because woodpeckers find carpenter bee eggs to be quite a delicacy. Unfortunately, this can cause additional damage to fascia boards on your home or property as the woodpeckers are pecking at the wood to get to the bee larvae that’s nested inside. There are a number of ways you can reduce the activity of carpenter bees on your property but if you would like to prevent carpenter bees from returning, it is best to contact a pest management professional to address the problem. As a homeowner, the best way to help prevent any carpenter bee nesting is to paint all exposed wood surfaces. 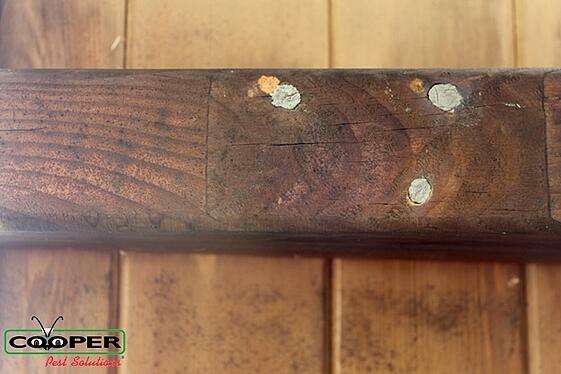 Wood stains aren’t as reliable as paint, but it still provides some degree of repellency as opposed to bare wood. The biggest problem with this is that the wood must be painted on all surfaces before installing it on the home. For example, if you paint the outer surface of the wood along the eaves of the home, the bees can still attack the unfinished back side of the wooden boards. What Can I Do about Fascia Board Damage and Carpenter Bees? 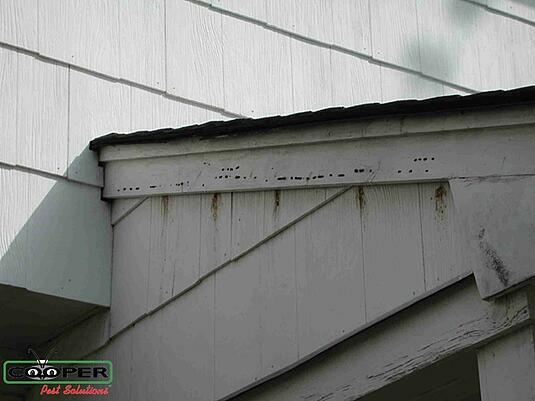 When carpenter bees nest, they typically nest behind fascia boards along a roofline on a home. If woodpeckers are searching for the carpenter eggs, they can leave damage along the fascia boards (eaves) as they peck into it for the eggs. If you are looking to replace the wood fascia boards, don’t just put up new wood. 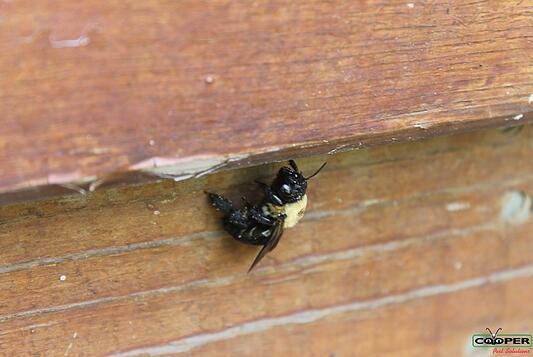 Carpenter bees will just re-infest the new wood causing you the same problems. If you want to prevent their return, wrap all THREE sides of the board in aluminum or vinyl siding. Do not just wrap the two exposed sides because the bees will nest on the underside of the board. Be sure to wrap the front, under and back side of the fascia board to prevent carpenter bee nesting. Carpenter bees CAN NOT chew through aluminum or vinyl so this will prevent future nesting if all sides are properly wrapped. Carpenter bees can cause aesthetic property damage if left untreated year after year, so it is best to choose a professional to handle your carpenter bee problem. There are a number of ways a pest professional may treat for Carpenter Bees, but a few common ways are residual liquid treatment, dust product application and plugging of carpenter bee holes. If you currently have carpenter bees, your pest control technician will spray the liquid treatment in areas where carpenter bees are boring into wood. If you’re looking to prevent carpenter bees, these treatments will be applied in March and early April before nesting begins. Your technician may use a dust product inside the current carpenter bee holes on your property as a remedial and/or preventive treatment. For remedial treatment, dusting will usually only work on active carpenter bees, not on eggs due to the walls protecting them within the tunnels. Your pest control technician may also use a cork, putty or caulking compound to plug the holes so that the bees are unable to return to the tunnels for future nesting. This is typically done during July or the summer months once all the active bees have left the nest and prior to the overwintering bees returning. Receiving effective preventive carpenter bee services can be difficult to find but Cooper Pest Solutions’ carpenter bee prevention is effective for a number of reasons. Dr. Richard Cooper, staff entomologist at Cooper Pest Solutions, also pointed out how important timing is when it comes to plugging the carpenter bee holes. Upon professional treatment for carpenter bees, there are a few tips and tricks you can do to continually decrease carpenter bee activity on your property. Paint all of your unfinished wood on your property, outdoor buildings and furniture. Freshly painted wood is even less attractive for a Carpenter bee. Seal all exterior openings, cracks and crevices with caulk. Carpenter bees will revisit holes from previous seasons, so be sure to caulk those openings during the fall months to help prevent spring infestations. Be sure to wrap all THREE SIDES of fascia boards in vinyl or aluminum to prevent carpenter bees from nesting in the fascia boards. Burgess added that whether you are painting or wrapping the fascia boards, it is crucial that all sides are painted or wrapped. Whether you continually have carpenter bee activity year after year or you have noticed an increased activity this year, give Cooper Pest Solutions a call at 1-800-949-2667. Our skilled technicians have the knowledge and tools to provide you with safe and effective bee removal. 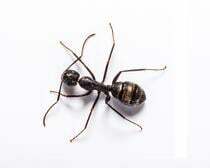 If you would like to prevent future infestations, Cooper Pest Solutions offers preventative services for future bee infestations. Our effective treatments are environmentally conscious and our service is guaranteed! Give us a call today at 1-800-949-2667 or fill out our FREE ESTIMATE FORM today! Carpenter bee services can now be scheduled online for fast technician dispatch on the date of your choosing. No initial inspection is needed.